This is pretty much my favorite time of year. It’s when all the best produce is out. It’s time for the excitement of all the freshness, and the sadness that soon it will be over. But of course, it doesn’t have to be! This year I didn’t do much in the way of canning- a couple of pints of roasted red peppers and pizza sauce was it for me- but then there’s still my favorite part of preserving: lacto ferments. For the past few years in the fall I’ve been making a big batch of kimchi, and I fully intend to do that this year, next week, I think. I also tend to make a big batch of Sauerkraut. Unfortunately, I tend to eat this less than the kimchi, so I decided to try something a little different. Making lacto ferments in small batches means I get to try different vegetables with different flavor profiles, which is always exciting. Many of the things I like to ferment remain available locally in the winter markets as well, so I can always make more small batches as I go- I’m thinking this is a good thing to try! 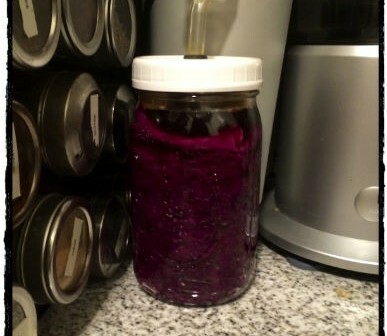 There are some great fermentation caps that can be used with mason jars- pictured is a Perfect Pickler. I tend to use a quart sized jar for these projects, but you can use a smaller one. For a 1 quart jar, you’ll want about 1.5 pounds of sliced cabbage and about a tablespoon of sea salt (non-iodized). Generally speaking with smaller amounts of Sauerkraut, if your really work the salt and cabbage together, enough liquid will release that you will not need to add supplemental brine. 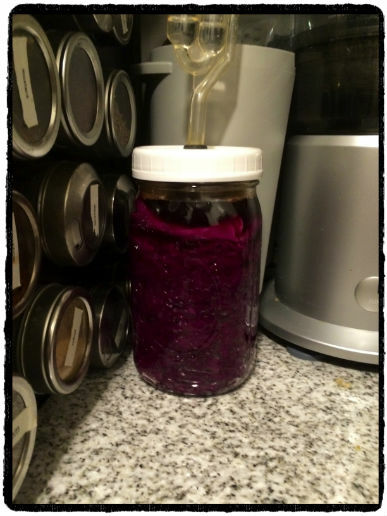 For a basic guide to making Sauerkraut, look back to this post. I actually bought couple of extra fermenting caps this week so I can have a few different ferments going at the same time. My current batch of Sauerkraut features fresh young ginger, and with this ginger, I’ll also be making a batch of ginger-carrots. Beyond that, I’ll be making a small batch of butternut squash and kale kimchi (while I’d love to share that recipe, it’s from The Kimchi Cookbook, if you’re interested). 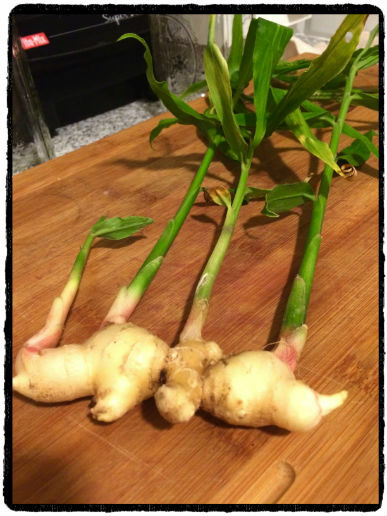 Fresh young ginger. The whole plant is edible! Lacto ferments are great to add to salads, soups, rice and other grains. They make great additions to sandwiches, and they’re great for topping vegan mac & cheese. While lacto ferments are high in sodium, as long as you account for that, it’s one more way to add veggies to your diet, and that’s always a good thing! I Eat Plants columnist Jodie Deignan went vegetarian in 2004 and fully committed to veganism in 2007. By day she’s a psychiatric nurse practitioner and by night she spends a lot of time cooking delicious vegan food for herself and her friends. She’s a bit of a picky eater, with a special distaste for mushrooms, seaweed, raw tomatoes, and eggplant, though she’s discovered along the way she’s a little more open-minded than she once thought. She blogs at The Picky Vegan.